This can be used either with or without a computer attached. 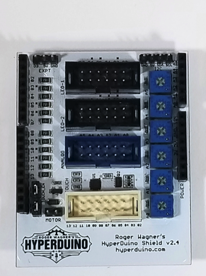 When the HyperDuino is not attached to a computer, and is in the self-running mode, each touch sensor turns on a corresponding LED. Touching sensor 13 changes the group of audio tracks used for the other sensors, so that alternate languages can be used, or other techniques such as long & short explanation, different musical sounds, etc. 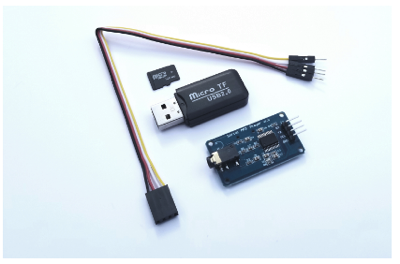 With a computer attached and the HyperDuino Media Linker running, tracks will play along with whatever Internet-based media is displayed. You probably wouldn’t want sound from both the mp3 player and a video, but you might want to have music, narration or other audio accompany “silent” Internet media such as photos, maps, etc. For example, this would be a way to add narration to a Google Maps or Google Earth display. 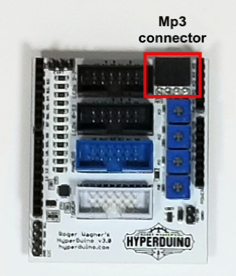 If you have version 3 of the HyperDuino, click here for alternate instructions. 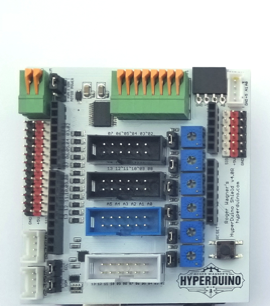 If you have the HyperDuino+R (robotics version v4.0 or later) click here for alternate instructions.